If you’re like I am when it comes to the end of the season, you want to hold on as long as you can. Normally I can only take sports talk radio in small doses. Super Bowl month? All day, all night, yelling at the speakers when someone calls into “Moving the Chains” or whatever show happens to be running at the time, leaving the NFL Network on in the background, actually buying a physical copy of Sports Illustrated to sit and read in quiet without the distraction of the internet. I wish I could embed it here, but the NFL keeps the good stuff on lockdown, so I’m just going to link to the video, NFL Films Presents: Best Shots From 2012. Enjoy the extra seven minutes of football while you can. This is a good one-two punch if you’re looking for recipes for the Conference Championship games. 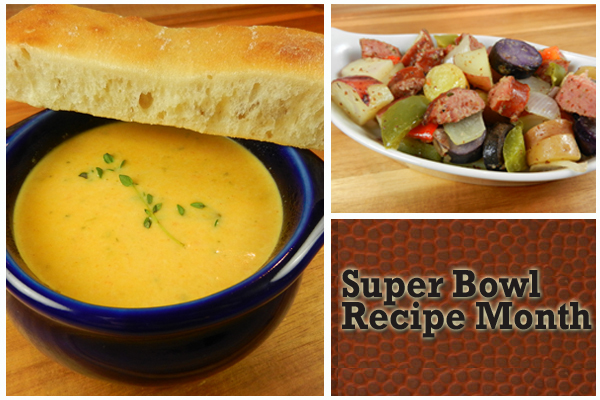 You can make a rich, cheesy soup filled with vegetables, herbs and spices for the 49ers-Falcons game and at the same prep an easy one-dish meal or side of hearty kielbasa, potatoes and peppers for Ravens-Pats that all you have to do is throw in the oven. Can’t think of an easier way to entertain this Sunday. Full post and recipes over on KSK.